Displaying images from wellknown URLs is quite straightforward. At times, however, you need to display images that are available as raw binary data. Consider, for example, that you are building a Captcha system that generates images on the fly. These images won't reside on the server as physical files. They will be generated and held in memory using System.Drawing classes (or something similar). To display them you can't point the src attribute of an <img> element to a particular URL as such. There can be multiple ways to deal with this problem. This article discusses a couple of them. The above code shows Index() action method of HomeController. For the sake of simplicity it uses a physical image file rather than dynamically generated image. The image file is read as a byte array using ReadAllBytes() method. In a more realistic situation you will replace the first two lines with the image generation logic of your own. Once the image content is read as a byte array, it is converted into a Base64 string using ToBase64String() method of Convert class. This Base64 string is used to form a data URL as shown. Notice how the data URL has data:image/png;base64 at the beginning. This way the browser knows that the src attribute value itself contains the image data. Make sure to change the image type (.png / .jpg / .gif etc.) 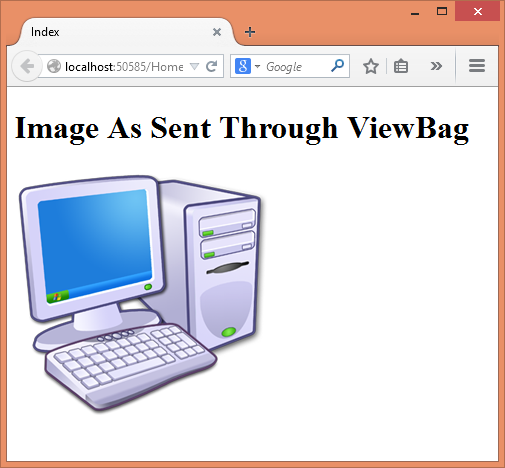 as per your needs, Then a ViewBag variable named ImageData is set to this data URL. Here, the GetImage() action method reads the image file into a byte array. It then uses File() method of the Controller base class to send the contents to the caller. The first parameter is a byte array that represents the file content and the second parameter indicates the MIME content type. Make sure to change the content type as per your needs. The src attribute of the image tag points to /Home/GetImage. If you run the application the result would be the same as in earlier case.